This little chalet is all made up of clay, straws, wood and all-natural materials from the area. You should know, this is not the wilderness, that inside you have everything you need, keeping cool in summer and warm in wintertime. And if the weather’s just fine, you can relax and admire nature from the flowery rooftop..
Popasul Verde is entirely built of all-natural, organic and recycled materials, most of which were procured locally, with very few exceptions imposed by the Romanian law on constructions, such as the concrete used for the foundation. However, the quantity of concrete was significantly reduced by adding stone. 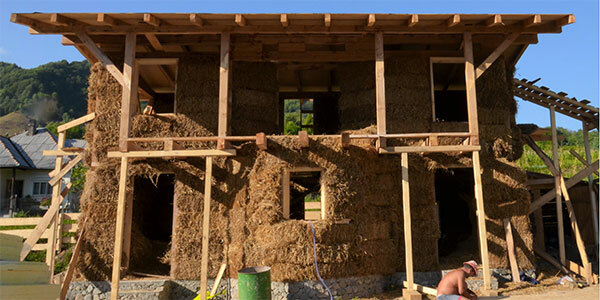 The structural frame of the house is made of wood and the outer walls of straw bales with an approximate width of 50 cm, plus the areas (in particular at the junction of walls) containing cob. 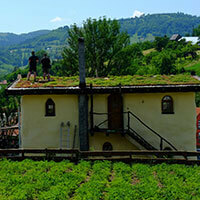 The “green” rooftop consists of a system allowing the growth of vegetation without the need for significant maintenance. This is possible through the use of certain type of plants resistant to extreme climate conditions, in this case being used succulent plants or sedums. 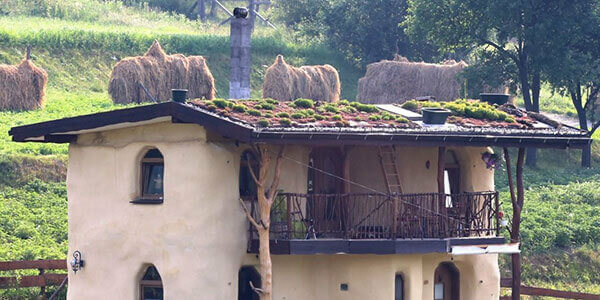 Such a rooftop, as the one used in the construction of Popasul Verde in Sângeorz-Băi provides very good thermal insulation besides the fact that it replaces the ground vegetation surface removed by the placement of the house. 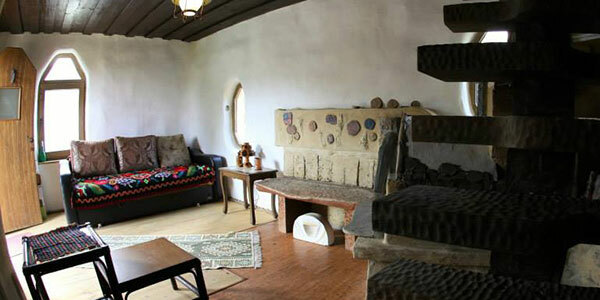 An entire series of decorative elements, such as niches in the walls, steps, but especially the bathroom and parts of the kitchen are and will still be finished with tadelakt, cob or lime plaster, bits of old, traditional house in the Sângeorz area that have collapsed, such as the “curly” rooftop or the old, support beams. Popasul Verde chalet is ideal to be inhabited by two families for long or short term periods, both in summer and in winter, with a minimum consumption of energy due to the excellent insulation properties of the walls and green rooftop. The large surface of the roof allows its use as a terrace, where you can find a small table for two. You can go up the rooftop through an interior access window. Popasul Verde house is build up from eco-friendly materials in a mountain area near the Rodnei Mountains. Near Popasul Verde you can find The Artistic Village from Dosul Garciului, created by the artist Maxim Dumitras, at a one-hour walking distance on the hills (see brochure). Cormaia is a dream place where you can cool yourself down with mountain water. After a road over Sângeorz-Băi hills, you can eat at the local Bed & Breakfasts or visit the beautiful ``Buna vestire`` Monastery. 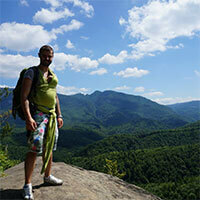 Rodnei Mountains national park is just at a stone's throw away. The Sângeorz-Băi and Rodnei Mountains area is one full of tradition and surprises at every turn, for a special stay. This house will be included in an eco-friendly tourist circuit with the aim to highlight the beauty of the natural landscapes in the area and to bring people closer to nature, making them more sensitive and perceptive to the attention to be given to the environment. "My escape revolved around the charm of this unusual house and the passion my host, Paul, has for architecture. The house is more beautiful than in the pictures. It is impressive to see how everything is arranged up to every little detail. I liked the way you hang your clothes in branches in the hallway. Seeing the village from the rooftop was really nice, especially at sunset. But the great thing is that there is a small garden. Ask Paul to take you to locals from whom you can buy organic eggs and milk. The weather was so pleasent so I could take a hike in the area, if you have some time ask for directions and go for it. " Just like Alice in Wonderland! Magical! "We had a wonderful time at Popasul Verde, the chalet was much more spectacular live than in the pictures!" "Wonderful ! Superb ! Sper să pot ajunge acolo într-o zi !" "The house was amazing, even better than shown in the pictures. We stayed for 3 nights at this place. We could buy fresh milk, eggs and cheese by the neighbor. The second day, Marcel, a friend of Paul that knows a lot of the area and he is a historian, explained us a lot about the places we visited." In order to actual feel the area at its true value, always be aware of the weather forecast.